There are moments and events in life that are so profound that we cannot help but be forever affected by them. This conference was one of those for me. I had written in my last post about the logistical aspects of the conference and now, I finally get to write about the trip itself and how the overall experience was. I can sum it up in one word: incredible. OK, that doesn't even really sum it up, but I thought I would try! I saw one of the Great Lakes! As a New England girl who is an ocean and water lover at heart, this was a huge deal for me. Despite the less than stellar weather, we got to take in the views of Lake Michigan, as well as the lighthouse that is situated there. If it was warmer, I could have sat there all day! We were going to try and eat dinner downtown and go to one of the observation towers, but we had been awake since 4:30am, had changed time zones, and we still had two full conference days ahead of us. So, we headed back to the hotel, via subway, and ate dinner there. Sometimes that's just the breaks when you have a chronic illness; concessions have to be made and you have to ration out your energy. The next morning, I didn't have to be downstairs at the exhibit hall until about 11:30am, which was good. It gave me time to pull myself together because honestly, I was a wreck. You have to understand that I had been working on Tales From the Dry Side since 2011. I had been communicating with people from the SSF, book contributors, and blog followers for YEARS, but had never met anyone in person. Besides meeting all these people and friends of mine for the first time, I was doing a book signing AND speaking that day as a panelist. I was shaking like a leaf by the time I got downstairs. It felt like this was the culmination of all my hard work and dedication to this project over the past several years. We went downstairs, met some of the staff from the SSF first, and then my husband and I set up our table. The table was right next to the book sale table, where all the SSF books were being sold. I have to say, I am glad I put as much effort into creating the book table as I did. Besides the book sale table, we were the only non-pharmaceutical table in the exhibit hall. At 12:30pm, the exhibit area was opened and from there, my weekend was non-stop. I was shocked over how many people came to our table, not just to have their copy of the book signed, but to talk, ask me questions, and share their own stories. I have been doing a lot of this online this whole time; communicating with other patients and sharing stories. But, it was MUCH different doing so in person. Everything is different in person when you are meeting people face-to-face for the first time. It was so hard for me not to cry when I finally got to meet these online friends and book contributors that I have known for years. These strong and amazing women that share their journeys with me every day, or every week. Really, words can not do it justice. You can tell so much from a person by communicating with them on Facebook, or via e-mail, several times a week, but it is a real treat to get to hear their voice, and notice their mannerisms! A bunch of us went to dinner on Saturday night and it was so funny because they all knew me, and some of them knew each other, but they didn't ALL know each other. Despite this, we got along famously and it was an evening that I know I will never forget. Imagine sitting at a table with four other women (or people) who have your same exact weird, unheard of, illness. But, you know them already, in a way. And, they all get it! That's a level of comfort that can be hard to find in the world. The two women to the left are Tales from the Dry Side contributors, Sandy and Sandi. The women on the right are long-time blog followers, Vicki and Sarah. The entire two day conference was non-stop. If I wasn't in a session with all the other attendees, I was out at the book table. It was a little strange because people knew who I was (from the table and the speech I gave as a panelist). People would stop to talk to me in the bathroom, the lobby, even on the shuttle bus back to the airport on Sunday. And, it was great. 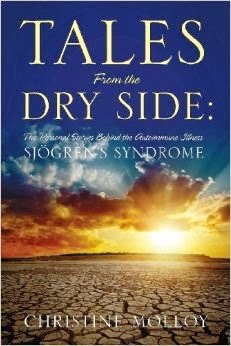 I felt all this knowledge I had from being a Sjögren's patient all these years was doing some good. One of the biggest highlights of the weekend for me was on Friday when I spoke on a patient panel about my experience with the illness and about why I wrote the book. I am NOT a good public speaker, although in hindsight, I am a much better one than I ever gave myself credit for. It was needing to get past the fear and anxiety of the task itself. My husband had suggested that I write out some note cards to help prompt myself, but I decided to wing it...the whole thing. I thought that if I thought about it too much, I wouldn't be an effective speaker. I also have a bad habit of looking down, and not up, when I am nervous and speaking in front of a crowd. Now I would HAVE to look up! After all, it was my story...I knew it by heart. Two blog followers/friends were also asked to speak on the patient panel, which was awesome! This is Heidi. I had about ten minutes to speak and it was truly ten of the most liberating moments of my life. It was me at a podium with about 450-500 people in front of me in a very large ballroom. I looked out at the crowd, and I just spoke. It was very important for me to not only tell my story and speak about the book, but to let people know that they are not alone, that they have to fight to get their medical needs met, and that they can never lose hope. And, that was what I did. Looking back, it is still hard for me to believe that that was me who spoke with such confidence and conviction. Sometimes, we never know what we are truly capable of, until we do it. Me trying to make a point. After that panel session, I got inundated at the book signing table, but one woman in particular stood out to me. She was waiting to speak with me and I noticed she was crying, a lot. At first I thought that she was sick or something and then when I went around to the front of the table to see if she was OK, she hugged me and told me she was crying because of how much I inspired her when I spoke. And that I gave her hope. That happened frequently at the conference; people telling me that either Tales From the Dry Side, my speech, or both, affected them in some profound way. They could identify with the stories from my fellow authors and they found what they were looking for and that was solace and hope. I had a woman tell me that after hearing my story, she was now going to be an Awareness Ambassador for the SSF because she figures that if I could go through what I have been through and then write this book, then she could do her little part for the cause. I heard other spouses telling my husband what a great support he is to me (that still makes me cry when I tell people about it). Finally, him getting the recognition he deserves because let me tell you, it is not easy being the spouse of a person with such a difficult illness. I was so deeply touch by hearing other's stories. They actually inspired ME. I had a very tough time physically getting through the weekend and hearing how some people struggle even more than I do, and yet still keep a positive attitude, helped fuel me through the whole event. I guess I would seem up this experience like this: I felt that the entire conference, in some way, validated my struggles. I told my husband this, and I don't think he agrees with me on it. I am not a believer that God made me sick just so that I could help other people. Actually, I don't even believe that God made me sick at all. But having all these experiences with people at the conference confirmed my belief that all the pain, sadness, and struggles I have had with Sjögren's syndrome have served a purpose. Every negative experience I had with a doctor. Every time a person said to me "you don't look sick." Every loss I suffered due to this illness whether it be my career or home. It has served a greater purpose in that I have been able to use it and turn it into something that gives other human beings information, inspiration, and hope. Not everyone gets that sacred opportunity so I thank each and every one of you who I spoke with and gave ME as much back as I have given you. From the airplane on the way home. This was very well said and I agree with all of it. Your experience mirrors much of my experience at the conference with being on the panel and helping out with registration. In fact, I used the word incredible to try to sum up the experience to others when I got home. Speaking to everyone and being a focal point for questions and suggestions all weekend was validation to me that what I was trying to do to conquer the disease isn't only helping me, it is helping others. That is the best gift I could have ever received! You describe the emotional side of the Conference so well. I agree that it's a moving experience to meet others with problems related to Sjogren's and make connections with them. It's something I look forward to all year. At the round table discussions at the Sjogren's Society of Canada it was great to hear the questions people asked and see how they fit right into issues that I or a friend might be experiencing also. Your table looks great and congratulations on your speech too. I wish I could have been there.